This sporty coupe is the brilliant Toyota and Subaru collaboration car, the Toyota GT86D-4S Auto, it is powered by a 2L petrol boxer engine, with a nippy 200 BHP and a 0-60 time of 7.6 seconds. 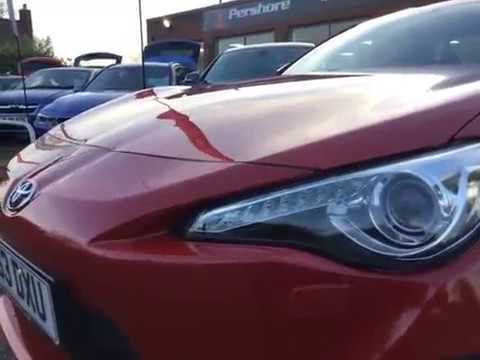 This GT86 has covered just 47054 miles since December 2013 and has a brilliant service record. This head turning coupe is presented in red with black and silver alloys, twin exhaust tips and rear spoiler. The interior has a great level of specification including 4 seats with black and red seat upholstery, sat nav, Bluetooth, cruise control, dual zone climate control, automatic headlights and automatic transmission with snow and sports driving modes! Before delivery this car will have undergone our extensive pre-delivery inspection covering all mechanical and cosmetic aspects of the car. All our cars come with a complimentary 3 month warranty which is extendable, fresh oil and filter change and a minimum of 6 months MOT and service if required. All our customers benefit from our Pershore Motor Group Reward’s Club which gives you FREE MOTs for life, 6 free wash and vacs by our professional team of valeters per year, £250 off your next car purchase with us at any of our showrooms and a £100 refer a friend bonus scheme.